TuneUp is a complementary app/plug-in to iTunes or Windows Media Player. Its main selling point is the ability to fix mislabeled song information and fill missing cover art, both of which it performs a fine job. I’m not usually ultra keen on running software trails but as my music collection seemed to be getting worse each day (and I can't see my iTunes shackles being broken anytime soon) I though I’d give TuneUp a go. It worked surprisingly well, especially on some of the Australian music that I fully expected TuneUp to fail on. 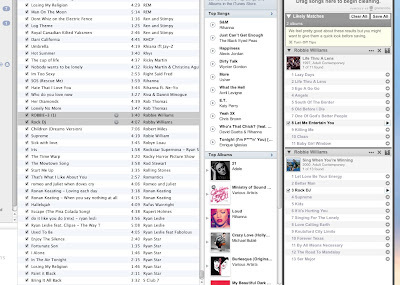 So its pretty simple to use, TuneUp starts alongside iTunes and you simply drag and drop the tracks you want fixed. TuneUp takes a few seconds per track while it contacts its servers, then displays its results with a rough rating on how close it thinks it is to being right. I assume it uses the wave form of the track, comparing it to either TuneUp's database or one of the many others. Most of the time the results was spot on, even finding tracks that had been cut from radio recordings many years ago. I estimate Its saved me around 2 full days of cleaning, and I think that's a fairly modest estimate. At the moment you can purchase a years license for around $20US, or a lifetime license for around $30US. Both of these licenses are restricted to one system activation, which can easily be moved to another system later on (simply install, activate and the previous will be deactivated). I managed to buy a lifetime for $22US via an email offer which made the deal a little sweeter. I was a little annoyed to see that the trail version had adds when I first ran the app. I think if you are trying to sell an app you should make it as clutter free and as little annoying as possible, especially when the trail has limits on how many tracks it can do. I was further annoyed when the adds didn't automatically turn off when I entered my newly purchased license key. I eventually found I could turn them off in the preferences, but the annoyance continued with a static social media bar (albeit a small one) at the bottom of the screen, dedicated to sharing the TuneUp name through the users profiles and accounts. Anyway, I’ll get over it. Apart from the bar down the bottom the UI could use a small amount of tweaking to reduce a few clicks or two (only a very small amount), but all in all its pretty clean and fast. Relatively cheap, leave your email with them and you might get it on sale. They seem to do sale every quarter or so. Decent accuracy (depending on your music taste that is). My collection is from all over the place. 10 year old radio recordings and Australian artist who haven't released albums outside of Victoria, all the way through to Elvis and Muse. Id say my success rate was around 92%. Relatively fast at getting results. Has saved me a massive amount of cleaning time (which I’ve been putting off for years). Stupid adds and a social media bar should have turned off when I punched in the license key (or scrapped altogether). Stupid mistake in my opinion. both are negative to the look and feel of the app, not sure why the developers don't see that. Needs a very small amount of UI tweaking, but not a big issue. Worth the money, does a fine job. Happy I bought it on sale but even at $30US I think its decent value. EDIT: One more thing, in TuneUps preferences I noticed I could increase the searched genres from 250 to 750. It seem to help on a few of the more strange albums, and didn't seem to cause any problems with other searches. I used this ages ago and it was crap. Might have to check it out again.